On the black fur of dogs and cats, must they be from pure blakc pets? can they be mixed but has some patches of black??? and what if i dont use black, will the other colors still do it but milder? You want it from an all black animal. Buy it from LuckyMojo they sell it under animal curios. i got the break up kit as well as the furs..
so i guess thats the same for the chicken feathers.. This may seem like a stupid question.. But I would like to add the cat and dog hair to a vinegar jar. Which is no problem for me since I have both as pets. My question is in using their hair in a dark spell (break up jar) can it in ANY way at all cause any kind of harm to my beloved pets? I love my babies way too much to ever do anything to jeopardize them for ANY reason. Like I said I know it may be a stupid question- but it is important to me. No. Your intent is not to harm them. Another example of this is accidently getting goofer dust on your clothes. Will you harm yourself? No because that is not where your intent is. Its just going to make the parties involved fight like cats and dogs. black cat and dog hair. I know this might be a dumb question, but does the cat and dogs have to be pure black? I have a cat that is black and white and I have a beagle which of course has the black and white on it..
Re: black cat and dog hair. Yes they do need to be pure black. 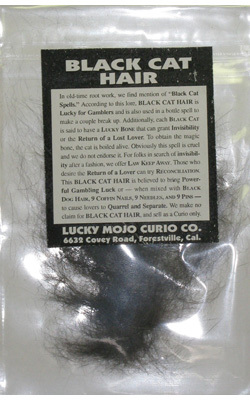 LM sells black cat and black dog hair if you need a source. I wondered about that since one of my cats is black and white. How much hair would you actualy use in a vinigar jar. Just one hair or several ? Thanks. Just a few, not too many. I just lost my beloved black cat the other day , but about a week before he died I did collect some of his hair. Is it still ok to use it? I mean I'm assuming he was sick when I collected the hair so will that make a difference or does that matter? It does not matter. The common sympathetic idea is that Cats and Dogs does not go well together and black is the colour of enemy work. lucky amulet with herbs and cat's hair. Hi, I just made an amulet . In a silver case, i put some pure saffron, some cat's hair/fur from the end of tail ( which i had heard were very lucky , had to thank my sleeping cat for that hehe ) and some tobacco from a cigarette . I have been wearing it around my neck . I have heard wonderful things about these items, and hoping for some good luck in my life, especially concerning love, finances and popularity . Re: lucky amulet with herbs and cat's hair. The items you chose are well adapted to the work you intend them for. Provided that your manner of preparation was in accord with tradition, you should expect good results. For further information on these items, see my book "Hoodoo Herb and Root Magic," where all of them are discussed at length. Thank you so much,how can I order these from Pakistan ? We have shipped to Pakstan in the past, although shipping charges are fairly high at your end, of course. I've merged your post to the appropriate subforum. Miss cat is one of the BIGGEST animal lovers in the world. Absolutely, positively, without one iota of doubt. NO ANIMALS ARE HARMED!! As Miss Aida says, Miss Cat is one of the biggest animal lovers in the world. I personally know the black dog from whom she harvests the hair The dog is petted, pampered, well-trained and well loved. The hair is harvested with a brush and comb. I'm not sure about the black cat – I know that the hair is harvested in the same way from a living animal, I'm just not sure whose it is. The yronwode cats have not yet deigned to make my acquaintance. I hope everyone enjoyed the holiday!!! Sorry if this seems like a silly question, I'm still learning, but I have seen spells where black cat and dog hair is used. 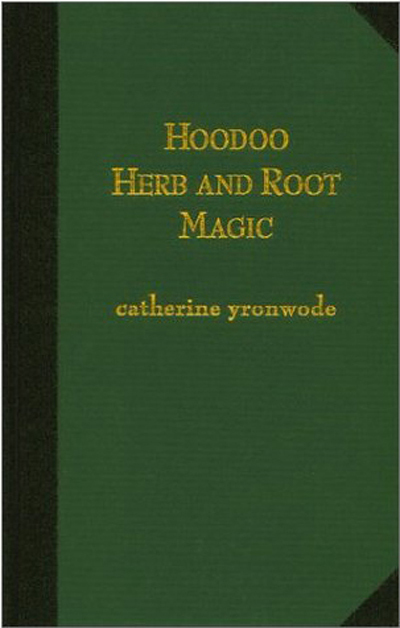 Is the hair of other colored cats and dogs used in hoodoo work at all? I'm curious too...still learning. Usually it's black colored animals, but just wondering if the color doesn't go with the skin colour, such as the sweeteners used for the honey jars? Dragonfly72, think of the old folk beliefs about black cats and black dogs in particular. Hell hounds are black; black cats are associated with evil witches. No such beliefs attach to brindled, red-coated, tan or white dogs. The beliefs about matching sweeteners to the target's skin color is about making the magical link as tight as possible -- and exists in the absence of other folk beliefs about the colors of sweeteners. I think the latter belief is specific to the US, a society historically much affected by institutionalized racism. I don't hear much from experienced workers about matching the color of sweetener to a target's race. Rootworkers, like other folks, are looking ahead to a brighter day. The hair sold at LM, is it poodle hair? I believe it is a Portugese water dog or similar breed . I want to make black arts oil, as I am making many oils myself, and buying the ones I don't know the receipe for from lucky mojo. 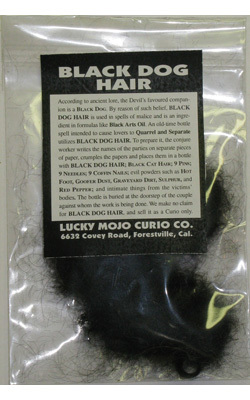 Now I read on many forums, including a forum from lucky mojo posted in 1999, that the black dog hair for black arts oil should be from a black poodle? Does this stand true? I want to get the dog hair at LM, and make the oil, BUT the poodle hair is what I'm having a bit of a hard time with getting, it's very specific. Where were you when I needed you? I was looking for that reference while writing my book: "Destroying Relationships". Now, it's too late as the book is ready to go to printing. Yes, it is said that the hair from black poodles, black Portuguese Water Dogs, and the like are a bit more potent. But you can still use hair from a black dog. That hair is still very workable.